The English name "Sparrowhawk" derives from its habit of preying on sparrows. The only source for the scientific name I can find says that it is a reference to King Nisus of Megara (from Greek Legend), who was turned into a Sparrowhawk. All of the references to King Nisus I can find say that he was changed into a sea-eagle or an osprey. Coincidentally, there was also a problem in the scientific naming of the osprey. It seems ornithologists may be good on birds, but they are lousy on Greek mythology. The Northern Sparrowhawk, or just Sparrowhawk, is the smaller of the two "True Hawks" resident in the UK (the other being the Northern Goshawk). Sparrowhawks are very similar in appearance to goshawks, though smaller. 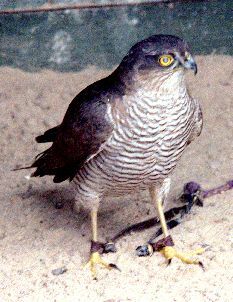 It is not unusual for a female sparrowhawk to be mistaken for a male goshawk. In flight they are similar in size & shape to kestrels, though they are distinguishable by the way they fly. Kestrels fly with a constant wingbeats. Sparrowhawks, similar to Goshawks, fly with a repeated sequence of several strong wingbeats, followed by a short glide. Sparrowhawks are found extensively throughout most of Europe & Russia, parts of the Middle East & the very northern tip of Africa. They have been found as far afield as Japan. The more northerly resident birds are migratory over the winter. They are mainly woodland birds, preferring lightly wooded areas such as orchards or the edges of more dense woodland. They are often found in urban areas, regularly preying on small birds using garden bird tables. Sparrowhawks were once the most populous of diurnal raptors in the UK. They managed to survive, relatively unscathed, the effects of the large scale killing of raptors during the Victorian period. Mainly due to widespread use of organochloride pesticides (e.g. DDT) during the 1950's & 60's the population was dramatically reduced, especially in the eastern arable districts. The population recovered & reached a peak during the 1980's, there has since been a reduction in numbers, the population is now estimated to be around 100,000 individuals. It is occasionally suggested that the population is too high in this country & should be reduced one way or another. This is nature at work, in an healthy environment with good food supply, the population will increase, if there were too many they would destroy the food source & there numbers would drop - nature keeps a healthy balance, and the reason for the recent decrease in numbers is thought to be due to the decrease in prey species. In 1954, when laws were passed protecting birds of prey in the UK, all were protected with the exception of the Sparrowhawk. It was 1962 when the laws were revised to include it. Sparrowhawks prey predominantly on small to medium sized birds (over 90% of diet), often attacking at bird-tables. They will feed on small mammals, such as mice & voles, worms & even carrion. They will use the technique of still-hunting, suddenly flying at the prey catching it in the air as it attempts to fly off (not mammals, worms & carrion though). They will also use available cover for suprise attack, by flying alongside hedgerows & suddenly flying over the top to catch the unwary prey. They have also been seen imitating the pigeon's style of flying, allowing them to get closer to their prey before attacking. A sparrowhawk has been observed drowning its prey (a small bird) after capturing it, taking it to a birdbath & submersing it for a few minutes, until it was sure that it was dead. When chasing their prey, they are often focussed on the prey & oblivious to other dangers. They often collide with such things as telephone wires & wire fences. When chasing garden birds, they may fly into windows. Occassionally, these accidents can be fatal. Sparrowhawks always nest in trees. They will usually build a new nest, though sometimes an old nest, possibly of a different species, will be used. Between 2 and 6 eggs are laid. The female will do all of the incubation, which lasts for around 5 weeks. The young are fledged in around 4 weeks & fully independent within 4 weeks of first leaving the nest. The oldest Sparrowhawk on record from a European ringing study was 20yrs 3months old. In Australian Aboriginal tales, the Moon possessed fire & refused to share it with Man, it is a sparrowhawk, along with a pigeon, that take it from him. In Egyptian mythology, Seth causes the death of his brother Osiris, the first king of Egypt. Osiris' wife, Isis, retrieved the body & hovered over it in the form of a sparrowhawk, fanning enough life back into him to conceive her son Horus. Horus is usually depicted as hawk or falcon headed. In Teutonic Mythology, the sparrowhawk represents the wind. The sparrowhawk appears in the Mayan myth of human creation. Man's flesh was made from the dough being made by the animal Coyote, which was killed by the sparrowhawk. The musket gun was named after the falconry name for the sparrowhawk. The surnames Spark & Sparks were derived from the nickname Sparrowhawk. (With thanks to Cathy Messina's entry in the guestbook).